The grassroots advocacy group No Labels on Monday threw more Washington muscle behind its bid to reform Washington. Two years after launching as a centrist-minded counter to hyper-partisanship, No Labels is also shifting its focus away from ideology and toward a pragmatic agenda to get Washington leaders working together to solve problems. Partisan Democrats and Republicans, as well as independents, are now welcomed into No Labels. Several hundred activists from across the country paid their way to attend the daylong convention in New York’s Times Square. Joining them were two newly minted No Labels leaders: former Utah Gov. 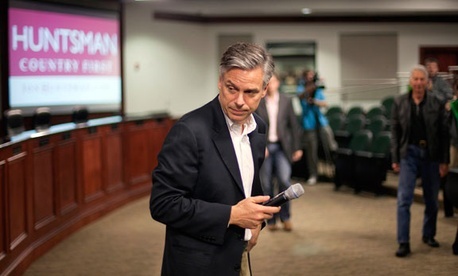 Jon Huntsman, a failed 2012 GOP presidential candidate, and Sen. Joe Manchin, a Democrat from West Virginia. In addition, 24 members of Congress have joined the New Labels' “problem-solving caucus,” committing themselves to the group’s agenda. No Labels cofounder Mark McKinnon predicted the caucus will grow to 75 by year’s end. On Sunday night, nine of the lawmakers, Republicans and Democrats alike, met in a New York restaurant for drinks. Loosening his tie, Rep. Peter Welch, D-Vt., told his colleagues: "We are all here because Congress is broken." On Monday, Rep. Kurt Schrader, D-Ore., gave the activists a glimpse at the level of dysfunction on Capitol Hill. "No Labels is the only opportunity, believe it or not, for your representative to sit down and talk," he said. He said this generation of Americans may not be called to fight a world war, end slavery, or put a man on the moon but it has a historic challenge nonetheless. “We have to take responsibility to say we will take back control of our politics, that we will move toward pragmatism," Booker said. Denying pay to Congress until a budget is passed. Requiring an "up or down vote" on presidential appointments. “Question Time” for the president, similar to what a British prime minister does with Parliament. Regular fiscal reports to Congress. Monthly bipartisan meetings of Congress. Two years ago, a group of high-powered political activists from both parties formed No Labels to encourage centrist problem-solving in an era of ideological gridlock. Mocked as naive and patronizing, the "Kumbaya Caucus" lacked a clear agenda and grassroots support. No Labels leaders believe they have addressed that problem and are poised to capitalize on the public's frustration with Washington. UPDATE: Will No Labels will make a difference? I'm not sure. But I do think it's indicative of something brewing in the nation: "Writin' About Revolution: 6 Reasons Why Both Parties May Become Obsolete"